There are a few foods that seem more likely to make people cry. For my kids, it might be broccoli. For me, it’s probably beets. But everyone seems to cry with onions. Still, it’s a food that you should consider making a staple in your survival pantry. Onions are good insect repellants. Just rubbing a slice of onion onto a specific body part can ensure that insects would stay away from that particular area. It is also useful for alleviating the pain that one gets from insect bites, especially bee stings. Insects are not a fan of onions, it is known. Therefore, onions can be a good ingredient in making an environmentally-friendly pesticide. Simply mix four onions, two cloves of garlic, two tablespoons of cayenne pepper, a couple of tablespoons of apple cider vinegar, two tablespoons of soap flakes, and a quart of water in a blender, and then get ready for mosquito-free nights for you and bug-free days for your plants. 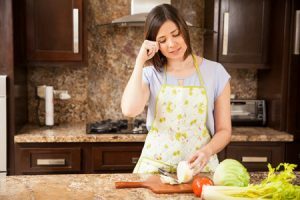 Much more efficient than smelling salts, onions are an excellent natural therapeutic medicine for dizziness and headaches. The smell of a cut clove of onion is sure to minimize the reeling feeling in your head. Yet another benefit is that onions can help to get rid of rust from knives. Simply rub an onion over the knife to clean the rust off. And there are a number of other great benefits of using onions such as making dyes, removing splinters, and extending the shelf life of avocados (yes, really). In light of all of this, unless you have an allergy to onions, you may want to consider keeping this handy food with you.